COME SEE OUR VIGNETTE AT MAY COURT CLUB OF OAKVILLE’S TABLE TOPS THIS WEEKEND! We could not be more excited and honoured to be a part of the fabulous Table Tops event this weekend, May 24th & 25th. 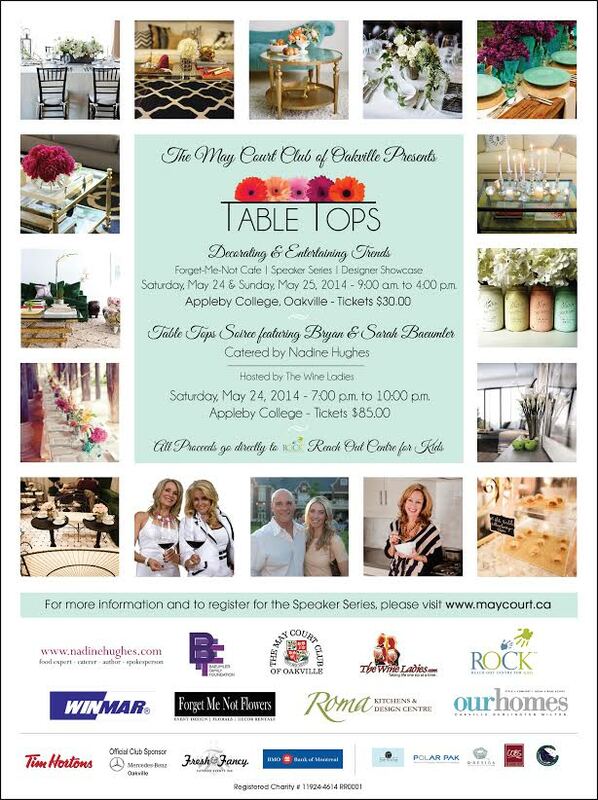 The Millionaire’s Daughter will be 1 of 26+ designers showcasing Table Top Décor at Appleby College, 540 Lakeshore Rd. West, Oakville. Best of all, all the proceeds of this event go directly to ROCK – Reach Out Centre for Kids. The theme for our Table Top vignette is Eclectic Elegance so get ready for a mix of vintage and modern and colourful and classic treasures on display from The Millionaire’s Daughter. Make sure you check ourFacebook page for updates throughout the weekend! Join us to support a great cause and enjoy decorating and entertainment trends by some fabulous & talented local professional. Your 1 day admission includes a Speakers Series focusing on all things decorating and entertaining. Get your 1 day general admission ticket $30.00 at maycourt.ca. Ticket includes FREE Speaker Series! 28+ Designers showcasing Table Top Décor & more — click here for the fabulous designer listing! Free *Speaker Series seminars included with General Admission Ticket — 14+ Decorating & Entertaining topics! Your one day admission includes our FREE Speakers Series seminars focusing on all topics decorating and entertaining – click here to view/download the Speaker Series schedule and presenters. Purchase Tickets and *Pre-Register for our Free Speaker Series (space is limited) here. + pre-registration for FREE Speaker Series! Limited number of Soirée tickets – don’t miss out and purchase tickets now! Stroll through the ‘tablescapes’ designed by décor experts — click here for the fabulous designer listing! Your Table Tops Soirée ticket includes a one day General Admission and access to our FREE Speakers Series seminars for either Saturday, May 24th OR Sunday, May 25th. Click here to view/download the Speaker Series descriptions. Pre-Register for the Free Speaker Series (space is limited) here.